Winter activities are right next to Le Manoir. Petite-Rivière-Saint-François’s Le Massif. Next to the Saint Lawrence River stands this majestic mountain where lush vegetation meets a microclimate favourable to heavy snowfalls. Le Massif de Charlevoix is a ski mountain located in Petite-Rivière-Saint François, Charlevoix, Québec, CANADA, a 70 km (44 mile) drive east from Quebec City and 10 km from Chalet Charlevoix Quebec. Overlooking the St. Lawrence river, it has the highest vertical (2,645ft) east of the Canadian Rockies. Apart from a big vertical drop and lots of snow, 650 cm of natural snow, Le Massif de Charlevoix is unique in that the area is accessible both from the top and from the base. The skiing season usually lasts from early December to late April. There are three peaks, two of which are currently developed. Le Massif has 53 total runs, supported by a high-speed gondola and 3 detachable quads, which provides an overall lift capacity of 11,200 skiers per hour. In 2013, Le Massif achieved many accolades and become an increasingly sought out destination. 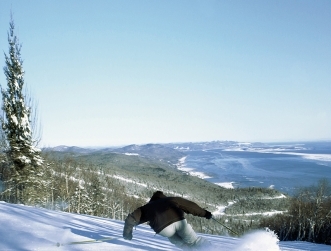 Le Massif was named Best of Skiing in Canada. Also, Le Massif was the Grand Prize winner of the Canadian Tourism Innovator of the Year category. The New York Times ranked Le Massif 36th out of 46 places to visit around the globe. Lastly, the National Geographic has chosen Le Massif as part of their 2014 Best Winter Destinations. lugeIn addition to skiing, Le Massif has a unique attraction – a toboggan run of 7.5 km long on Mount Liguori. This is sure to be a breathtaking experience and a memorable activity for family and friends. Le Massif de Charlevoix gets a lot of snow, and keeps it, as the region gets little rain for an eastern North American ski area. The natural snowpack (in the trails) can exceed eight feet at the summit during a typical winter. However, since the base is at sea level, it can lose its snow quickly during the spring thaw. The year 2001 started a tide of significant change for le Massif de Charlevoix. A new road was built from Quebec Route 138 to the top of the mountain, making the distance between Quebec City and the summit of le Massif summit just 70 km (44 miles). In 2002, Daniel Gauthier, co-founder of le Cirque du Soleil, bought Le Massif. Under Mr. Gauthier’s leadership, le Massif is undertaking a major development known as Territoire Le Massif. In 2009, le Massif added 26 acres of off-trail skiing on Mount A. Liguori. There are also plans to open up the third peak to skiing, and transform the mountain and surrounding area into a distinctive four seasons resort, while respecting environmental values. In September 2011, a new tourist train service from Quebec City to La Malbaie began operation, making a stop in the winter at Le Massif. Le Train travels between mountains and seashore, along 140 km of breathtaking riverside scenery of the St. Lawrence River. 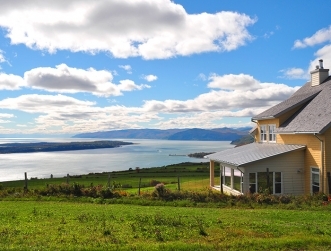 The recent opening of Hotel La Ferme has brought a new hotel, services and activities to Baie-Saint-Paul, Quebec.